Since the lift-off of Sputnik in 1957, over 8,000 satellites and spacecraft have been launched from over thirty countries, costing hundreds of billions of dollars. While only about 350 people have made the incredible journey beyond our atmosphere, we all benefit in countless ways from the missions. 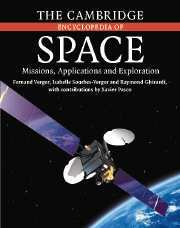 An authoriative and accessible source that collects information on man's quest to explore the Universe, The Cambridge Encyclopedia of Space, provides a global perspective of our occupation and use of space, whether for scientific, industrial, commercial, technical, or military purposes. The authors set the stage by describing the space environment, orbits and ground tracks, launchers and launch sites. Subsequently, they discuss the main space applications (telecommunications, navigation and Earth observation, military), plus science missions, planetary exploration, and space stations. Extensively illustrated with more than 300 illustrations, maps, and graphs, The Cambridge Encyclopedia of Space will be an invaluable resource for everyone interested in our use of space, and the perfect reference for those working in the space arena. Fernand Verger is Professor Emeritus of Geography at L'Ecole Normale Supérieure, Paris. Isabelle Sourbés-Verger is a researcher at the National Center for Scientific Research and the Foundation for Strategic Research, Paris. Raymond Ghirardi is a cartographic engineer at the CNRS and has worked on many geopolitical projects. Xavier Pasco is a researcher at the Foundation for Strategic Research and Associate Professor at the Universite de Marne la Vallee. Pasco is also a Fellow at the Space Policy Institute at George Washington University in Washington, D.C.